TMEZON 1080P HD Pan Tilt Zoom Wi. TMEZON Smart and Innovative IP Video Intercom System. You can answer the door in your hand! 7 inch TFT display monitor with slim design, touch-key operation, hand-free, Support Wifi/RJ45 port connect to internet (Only connect with 2.4GHZ router band). 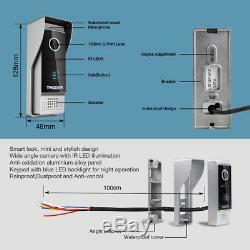 Outdoor doorbell with waterproof cover, built-in infrared sensor and 1200TVL camera, 100º wide view angle, Night Vision, Rainproof, Dustproof, and Anti-vandal. Dual-Way Communication between indoor monitor and camera; Call Transfer among monitors. You don't need go downstairs to open the door after install the multiple intercom. You can check the recording via smartphone anytime. Please note the wifi video intercom system does not mean you dont need wire any cable. The monitor support WIFI network, but the indoor monitor and doorbell is Wired, which make sure the power, the video work stable and you can extend longer distance. Display:7 TFT LCD(16:9), 800(H)x480(V) Unlock: Monitor, smartphone and tablet unlock Memory: Micro SD Card not include, 64GB max. 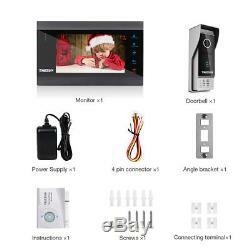 Network: WIFI/RJ45 port Power Supply:Built-in(AC 100240V), DC12V Multiple Intercom:Up to 4 monitors(The slave monitor is MZ-VDP-739EM) Multiple Doorbell:Up to 2 doorbells Ringtone:16 ringtones optional Made Of Acrylic wire drawing panel and TFT display Installation: Surface mount(Wall mount). Camera sensor: 1/4 CMOS, 1200TVL Pinhole/ 100°wide angle camera Anti-oxidation aluminium alloy panel Simple 4-wire connection IR LED illumination for better night vision Keypad with blue LED backlight for night operation Rainproof, Dustproof, and Anti-vandal Power Supply: Supplied from indoor monitor. 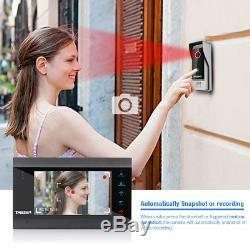 Design to watch over your home security, latest IP technology to remote unlocking, monitoring, dual-way communication, video record, and more. Easily access to speak with the visitor through the APP. APP support IOS/Android system smartphone and tablet. The extension wires is not included in the box, but we will provide the 4 core connector for you connect the extension wires. You can use RVV4/ Cat5/ Cat6/ RG59 wires to extend the monitor to doorbell, or monitor to monitor according to your need, maximum distance can exceed 100M. Our Full range product offers a flexible choice for customers with special requirements. Our equipment is designed for homes, offices, bars and retail shops. All our products are easy to setup and control, we are confident anybody can install and operate our products. We have professional and patient after-sales team to service all customers. All your messages will be responsed in 24 working hours. And all the problems will be fixed out with a positive solution. 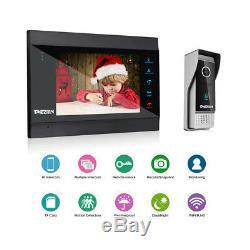 The item "Tmezon IP LCD Intercom Video Doorphone Night Version Camera 7 Inch Touch Monitor" is in sale since Wednesday, April 11, 2018. This item is in the category "Home & Garden\Home Improvement\Building & Hardware\Doors & Door Hardware\Doorbells". The seller is "tmezon_security_technology" and is located in Zhuhai 519000,Guangdong. This item can be shipped worldwide.